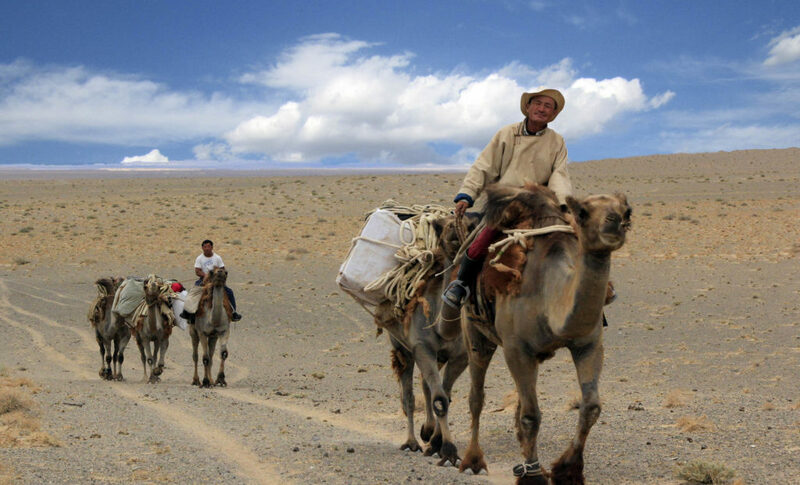 Activities: Camel riding upon guest’s request, trekking in the Gobi Desert and Eight lakes region, visit Erdenezuu temple museum and Kharkhorin archaeology museum, visiting temple ruins as mentioned in the itinerary, loading camels and yaks, experiencing typical Mongolian local family life style and food. Tour price: $2210US per person. We’ll start our trip with a full day of driving to the Baga Gazariin Chuluu Ruins (1768 m high granite stone mountain in the territory of Adaatsag soum, Dundgobi province. There some old temple ruins related with 17th century. Also, we’ll be able to see a deep narrow hole with water in it which locals believe in that the water could treat the ocular illnesses. We’ll spend the night in a family’s spare yurt. We’ll drive to the scarp of Tsagaan Suvarga which is in Ulziit, Dundgobi province. It is interesting to see the sheer slope, facing east, which from cliff is 30 meters high and 100 meters wide. Over thousands of years the wind has created this amazing structure. We’ll stay in a family’s spare yurt. We’ll drive to a yurt camp which is located close to Yoliin Am. 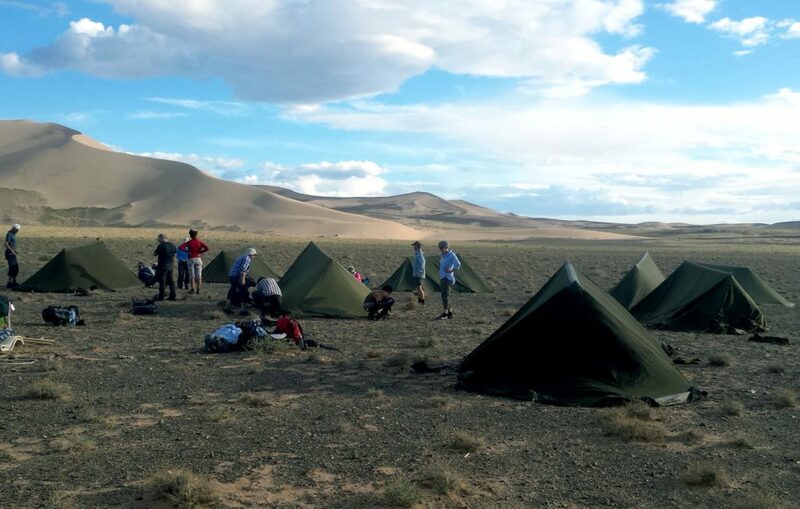 Yoliin Am is in Gobi Gurvan Saikhan National park which is the biggest strictly protected area in Mongolia. The mountains here are the highest in the Gobi Desert and the rocky scenery is quite interesting, especially until mid-July while the ice in a gorge remains. We’ll spend the night in a yurt camp. In the morning, we’ll drive to Yoliin Am for 30 kms then we’ll walk 3kms in the narrow valley, then 3 kms back to the minivans. And then we’ll have lunch at open air. After that we’ll drive to Khongoryn Els Sand Dunes (195kms). The Khongoryn Els is some of the largest and most spectacular sand dunes in Mongolia. We’ll spend the night in a family’s spare yurt. In the morning, we prepare our luggage and the camels for our trekking (camels are only used to carry all the stuff). We’ll start trekking in the afternoon after lunch and walk west/northwest for about 3-4h till find a nice camping spot. We’ll go trekking 5-7h along the dunes. Lunch somewhere on the way. Cross to the southern part of the dunes. We’ll camp under the beautiful sky. 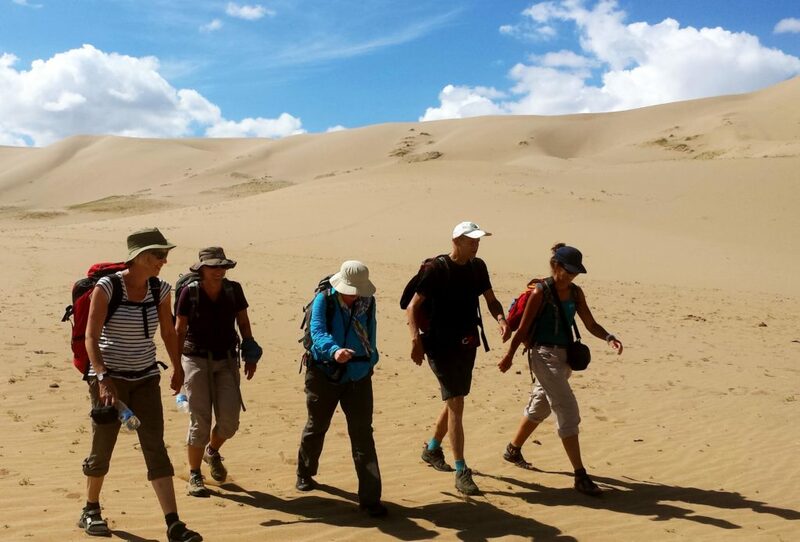 We’ll go trekking 5-7 hours to get to near oasis in the north of the sand dunes. Say good bye to the local crew. Walking to the yurt camp after breakfast for a couple hours. It’ll be our last part of our trek. Depends on the distance maybe pick up by cars and drive back to the yurt camp. We’ll have relaxing day after few days of trekking through the sand dunes at Khongoryn Els. We’ll start driving to Bayan-Zag(150kms) in the morning. When we arrive at Bayan-Zag, spend the night in tents. Bayan-Zag means “rich in Saxaul Shrubs” is more commonly known as the “Flaming Cliffs” of Bayan-Zag, famous for the discovery of dinosaur fossils. We’ll drive to Ongi temple, which are ruins of two monasteries that face to each other across Ongi river in Saikhan-Ovoo, Dundgobi province, Mongolia. Founded in 1660, it was one of the largest monasteries in Mongolia and housed over 1000 monks at its height. Both complexes of Ongi Monastery were destroyed in 1939 during anti-religious purges carried out under Choibalsan Kh, the leader of the Communist Party of Mongolia. Over 200 monks were killed, and many surviving monks were imprisoned or forcibly laicized and conscripted into the Communist controlled army. We’ll spend the night in a yurt camp. We’ll drive to Arvaikheer. We’ll stop for lunch at open air. We’ll stay in a local hotel to experience it. The hotel facility is pretty basic and don’t get shock if you need to share the shower. We’ll drive to the start of the trekking. Meet the local crew, prepare the luggage for the trek. Maybe short walk in the area. Pack our luggage on the yaks. We’ll go trekking 3-5h, on the way, we will have break and have some snacks like sandwiches. We’ll see Shireet lake and trek a bit further. We’ll camp in the National park. We’ll go trekking 3-5h, lunch on the way (maybe at a family). We’ll find a nice spot and camp. We’ll go hiking to Buureg yurt camp have lunch there. In the afternoon we’ll drive down to waterfall area. 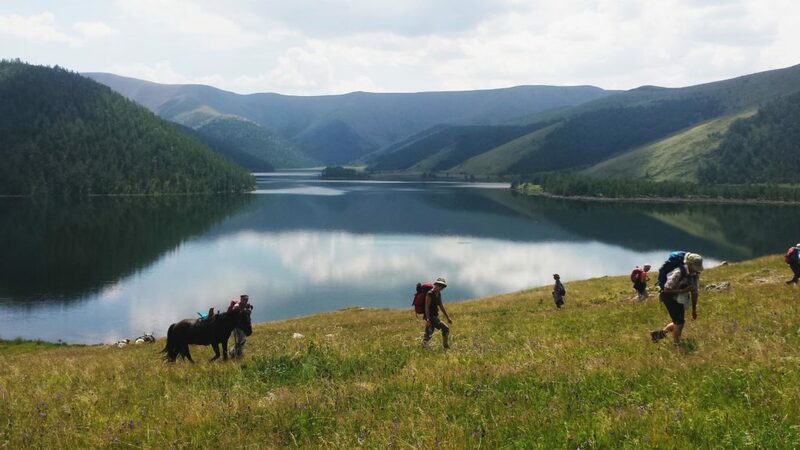 We’ll visit the Orkhon waterfall and drive back to the yurt camp for dinner. We’ll drive to Kharkhorin, an ancient capital of Mongolia to visit Erdenezuu temple and Kharkhorin museum. We’ll have lunch after the visit and then drive to Khogno Khaan mountains. We’ll stay in a yurt camp. After breakfast, we’ll drive to Khustain National park to see wild horses. Finally, we’ll drive back to UB. Camel herders taking all the luggage on the camels during the trek. Guests are resting in the shade right after arriving at the camping spot.